Proceed north on I-83 (Jones Falls Expressway) to I-695 west toward Pikesville. Take Exit 19 (I-795) to first exit, Exit 4 (Owings Mills Blvd.). Bear right off ramp onto Owings Mills Blvd. North (toward Rt. 140, Reisterstown Road). Pass six traffic lights. The sixth traffic light is at Gwynnbrook Ave. Continue approximately .2 mile. The entrance to MPT (Ruth R. Marder Way) is on the right. Proceed north on I-95 to Exit 49-B (left exit, I-695 toward Towson). Take Exit 19 (I-795) to first exit, Exit 4 (Owings Mills Blvd.). Bear right off ramp onto Owings Mills Blvd. North (toward Rt. 140, Reisterstown Road). Pass six traffic lights. The sixth traffic light is at Gwynnbrook Ave. Continue approximately .2 mile. The entrance to MPT (Ruth R. Marder Way) is on the right. Proceed south on I-95 to Exit 33 (I-695 toward Towson). Take I-695 to Exit 19 (I-795) to first exit, Exit 4 (Owings Mills Blvd.). Bear right off ramp onto Owings Mills Blvd. North (toward Rt. 140, Reisterstown Road). Pass six traffic lights. The sixth traffic light is at Gwynnbrook Ave. Continue approximately .2 mile. The entrance to MPT (Ruth R. Marder Way) is on the right. Southeast on MD Route 140 to entrance ramp to I-795 (Northwest Expressway). Proceed on I-795 toward Baltimore to Exit 4 (Owings Mills Blvd.). Bear left off the ramp and then right onto Owings Mills Blvd. (toward Rt. 140, Reisterstown Road). Pass six traffic lights. The sixth traffic light is at Gwynnbrook Ave. Continue approximately .2 mile. The entrance to MPT (Ruth R. Marder Way) is on the right. From Route 70 East to Beltway 695 toward Towson. Route I- 795 to Owings Mills. Take first exit, Exit 4 (Owings Mills Blvd.). Bear right off ramp onto Owings Mills Blvd. North (toward Rt. 140, Reisterstown Road). Pass six traffic lights. The sixth traffic light is at Gwynnbrook Ave. Continue approximately .2 mile. The entrance to MPT (Ruth R. Marder Way) is on the right. South on I-83 (Harrisburg Expressway) to Exit 20 (Shawan Road West). Proceed west on Shawan Road which turns into Tufton Avenue. Continue west until Tufton deadends at Worthington Ave. Turn right and proceed north on Worthington Ave. approximately .4 mile to Bonita Ave. Turn left and continue on Bonita approximately 2.3 miles until it deadends at Owings Mills Blvd. Turn left and drive .3 mile. The entrance to MPT (Ruth R. Marder Way) is on the left. Take I-97 North toward Baltimore. Merge onto I-695 West (Baltimore Beltway Inner Loop) via Exit 17A toward Baltimore/Towson. Merge onto I-795 North via Exit 19 toward Owings Mills/Reisterstown. 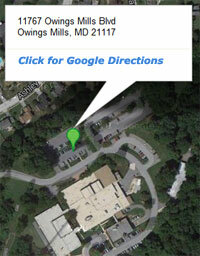 Take the Owings Mills Blvd. North exit- Exit 4- toward MD-140/Reisterstown Rd. Turn slight right onto Owings Mills Blvd. The entrance to MPT (Ruth R. Marder Way) is on the right.